At 9:30am it was time for the Xpedition city tour of the old part of Quito along the other participant in our Galapagos tour. We were up at 7am and downstairs for breakfast. See the short video: City Tour Quito, Ecuador. 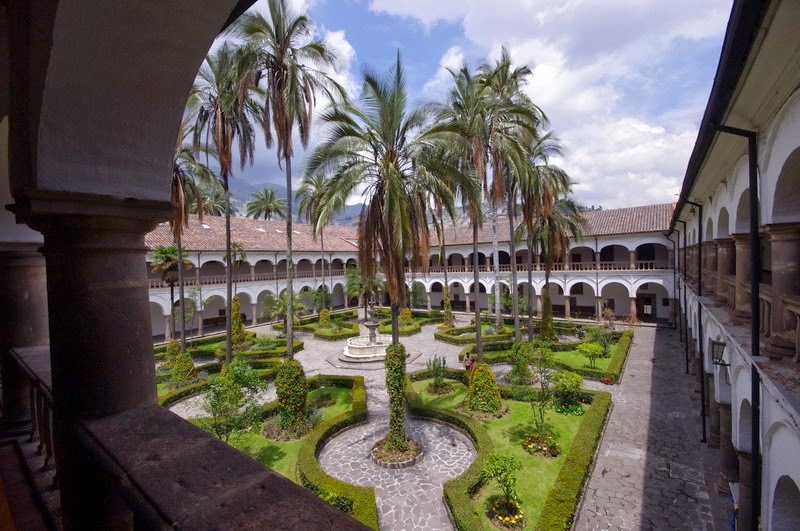 Quito is an incredibly beautiful city with many ornate church, colonial houses and beautiful monuments, although the city has been devastated by volcanic eruptions and finally a big earthquake in 1987. Our first stop was a magnificent gothic Basílica del Voto Nacional set atop a hill looking over the Spanish colonial town. Standing outside the basilica we could look down over a series of whitewashed colonial buildings. On a distant hill, a massive statue of the Virgin Mary watched over the town. Then we went to the town square. 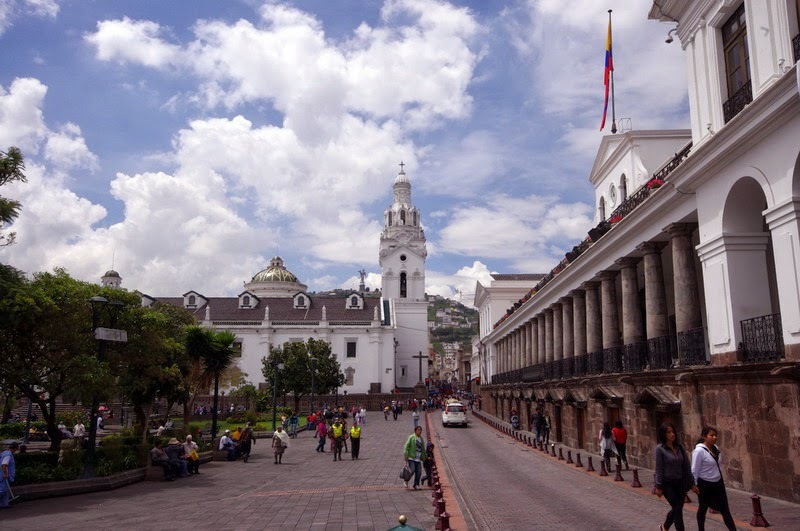 On one side of the square stood the Carondelet Palace, office and house of the Presidents of Ecuador. and to the right the Cathedral Metropolitana de Quito. 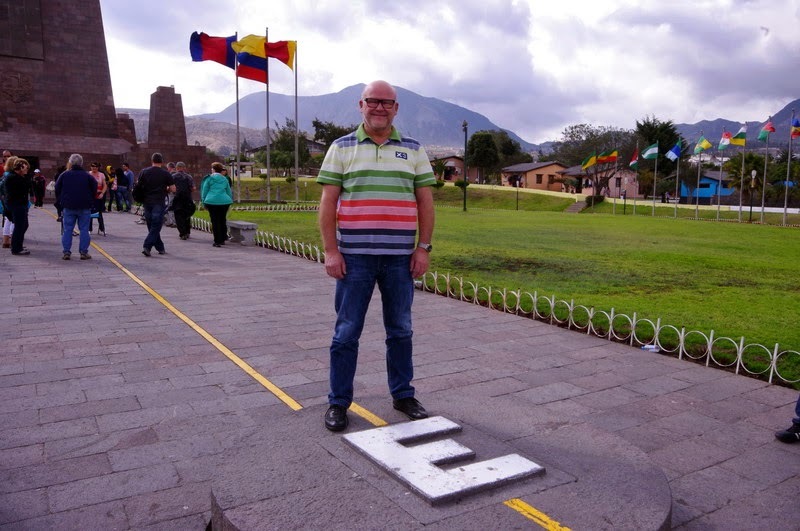 The middle of the square was marked by a monument to Ecuador's independence from the Spanish, achieved in 1834. The highlight of the tour of the old town was a visit to a Jesuit church, Church of La Compañía which has been painstakingly restored with gold leaf, so that all of the interior glimmered like an enchanted hall from a fairytale. Church and Monastery of St. Franciso where we visited the Courtyard of the Monastery and the church. - after the city tour we went for lunch with local specialties at Theatrum restaurant located all over its second floor in the National Theater (Teatro Nacional Sucre). Theatrum offers an extraordinary menu of the vanguard Mediterranean cuisine, where seafood, fish, meat, birds and ducks combine with fine aromatic herbs and local and imported ingredients. All participating in the Xpedition Galapagos tour were invited to dinner, at an Italian restaurant in the evening. A great dinner despite the relatively large number of guests ( about 100 in total). We were already back at the hotel at 8:30PM and then have our suitcases packed - We had to deliver our checked luggage to the Celebrity Cruises no later than 10PM for inspection. All of the luggage did undergo a search for food or plant products that could introduce harmful organisms into the Galapagos ecosystem by the ' Galapagos Agricultural Authorities ' - so we did avoid the check in Quito airport or at arrival at Baltra. The suit cases was collected and was brought directly from the hotel to the plane in the morning and they were delivered directly to our cabin on the Celebrity Xpedition. You are permitted only 20 kg (44 lbs) of checked luggage. I did sense that the weight limit is per family rather than the individual pieces. If so needed you can leave some at you luggage not needed for the cruise at the hotel.